Yet another surprising data point in the 2018 Internet Trends report is the amount of money American companies devote to Research and Development. 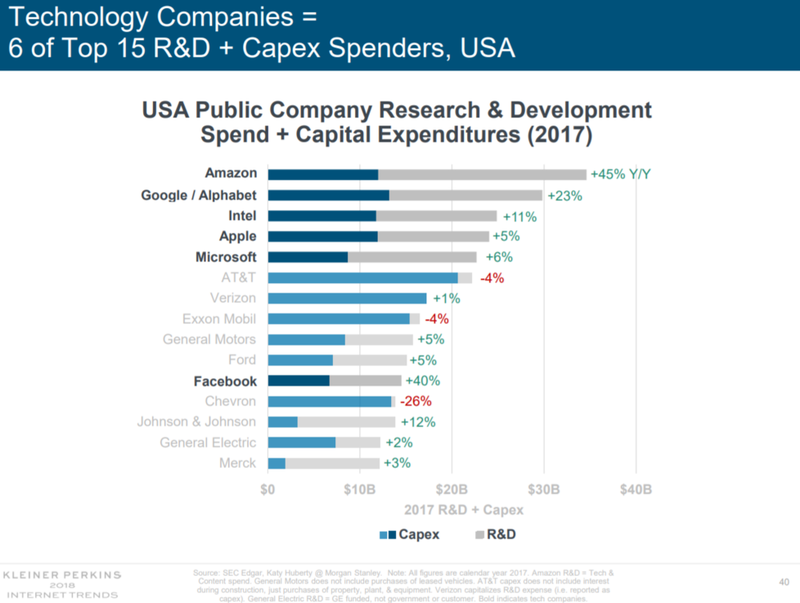 Tech companies spend 18% of their revenue on R&D and Capex; with Amazon at $34 billion, Google at $30 billion, Apple at $24 billion, and Facebook at $15 billion, with the industry total at approximately $260 billion. More than half of those GAFA figures are flowing into R&D, an investment into the future. We are not sure if that includes the free cash used for acquisitions, but an acquisitive posture in the industry by incumbents is also great at motivating entrepreneurs to start companies in the space and contribute to overall growth. 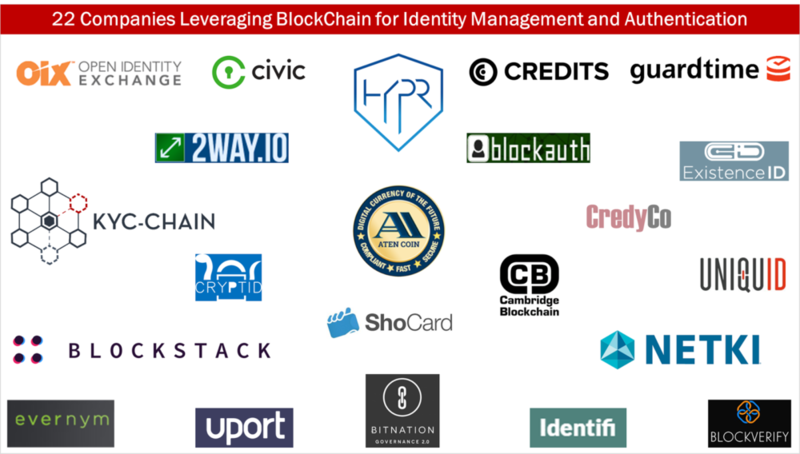 This clicked for us because we were recently at a Fintech event at a top-5 global custodian, where the audience discussed how historically the financial services industry itself has not had an R&D function, and that Innovation and Corporate Venture arms of financial incumbents targeted at the Fintech industry are now essentially catching up. In fact, this was true for all of venture. In 2010, global venture capital investment was $45 billion, of which less than $2 billion was in Fintech. That's less than 4% and completely out of balance. Remember that financial services as percent of GDP is about 20%. In 2017, global venture capital was $130 billion, with Fintech funding at about $30 billion -- that 23% looks far healthier. But when we look at financial incumbents, a similar level of future investment is simply not present. We had done a deep dive on tech spending and Fintech readiness by big banks last year, called Bankosaurus. We found that the biggest spender was JP Morgan, with a $9 billion tech budget, of which about $6 billion flowed through the P&L. That's not R&D, but the cost of keeping all tech running, plus investments in technology. In the graphic below, you can see that few banks have more than $1-2 billion to devote to technology, and even less to devote to Fintech. Total tech spend is 5-25% of costs for most banks, which implies 3-12% of revenue, give-or-take. Haircut that by 50% for keeping the lights on, and you have 1-5% devoted to R&D. Thus the leading banks are spending 5% of revenue on "change the bank" initiatives, with the rest quite behind. Not a pretty picture, and one that has to change for finance to remain relevant. ONLINE BANK: Neobank Contrast: Revolut or Simple? Which banking team do you think young developers out of university will be more excited to join? Is it neobank Revolut, which is publicly committing to include cryptocurrencies like Bitcoin, Litecoin and Ethereum into its mobile app based on community feedback? 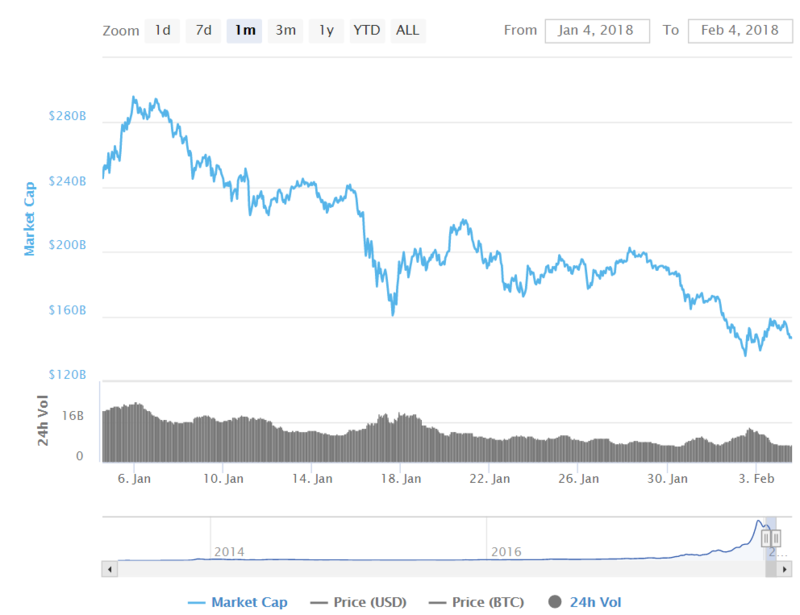 This development would turn Revolut into both a crypto-wallet and an app-based exchange in the long term. Or is it Simple, the famous neobank that BBVA Compass acquired in 2014 for $117 million, wrote down $60 million last year, and that continues to apologize to its customers for forgetting how to innovate? And why is Simple mired in integration while Revolut captures the imagination of its users? Because it has been re-writing a core processing system from scratch, and is talking about budgeting and planning when the world is talking about conversational interfaces and virtual assistants. Vision and mission are the differentiating factor in our economy. Without vision, there can be no purpose. Without purpose, how can organizations attract a world-class team? What is your vision?